The Buick Enclave for Sale in Lynnwood, WA from Carson Cars is one of the most stylish vehicles that are currently available in the market. The 2013 model introduces a range of new improvements and enhancements in to the vehicle, providing a more stylish exterior and a more comfortable interior. Buick has been renowned for making stunning vehicles that really capture the imagination of the crowd, and they have surely outdone themselves with their latest model of the Enclave midsized luxury SUV. The company places a lot of focus upon luxury, and it is evident the minute you lay your eyes on the vehicle. The Buick Enclave is powered by a 3.6 VVT V6 engine with direct injection, which is capable of producing up to 288 hp and 270 lb of torque. The engine itself uses the latest technology from the company in order to provide maximum fuel efficiency and the smoothest of performances. Also, the company’s trademark Stabilitrak technology with traction control has been fitted in to the vehicle, which significantly improves performance and provides you with a much smoother driving performance, as it constantly monitors your intended steering path in order to ensure you do not lose traction. 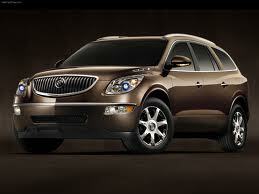 The Buick Enclave includes everything that you would expect from a top of the line luxury vehicle. Ranging from comfortable leather seats that come with Smart Slide Technology to three zone climate control systems as well as rear seat DVD playback, everything is included to make your experience as good as possible while driving. There are 8 seats with lots of leg room, and the IntelliLink radio with voice commands as well as a 7 inch color touch screen ensures you stay on top of all the information while driving. Check out the Buick Enclave for Sale in Lynnwood, WA from Carson Cars today!